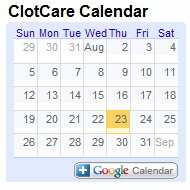 ClotCare: Is It Safe to Withhold Anticoagulation if Ultrasound is Negative? Is It Safe to Withhold Anticoagulation if Ultrasound is Negative? A recent study and accompanying editorial indicate that symptomatic patients with a negative comprehensive ultrasound are very unlikely to have a venous thrombotic event within the following three months if anticoagulation is withheld. Review: Stevens SM, Elliott CG, Chan KJ, Egger MJ, Ahmed KM. Withholding anticoagulation after a negative result on duplex ultrasonography for suspected symptomatic deep venous thrombosis. Annals of Internal Medicine 2004; 140: 985-991. In this prospective cohort study, 445 consecutive patients with symptoms of a first DVT were referred to a peripheral vascular laboratory for one comprehensive duplex ultrasonography. 384 patients (86.3%) tested negative for DVT and anticoagulation was withheld in this negative cohort despite signs and symptoms. Nine of these patients received anticoagulation for reasons unrelated to venous thromboembolism (VTE) and were excluded from the final analysis. At 3-month follow-up, 3 of 375 patients (0.8%) developed a DVT as confirmed by repeated comprehensive duplex ultrasonography testing. One of these 3 patients developed a proximal DVT. No patients developed PE or died secondary to a VTE event. This study does confirm the value of utilizing one comprehensive compression ultrasonography exam to rule out DVT. Review: Kheir DE and Buller H. One-time comprehensive ultrasonography to diagnose deep venous thrombosis: Is that the solution? Annals of Internal Medicine 2004; 140:1052-53. A potential disadvantage of the comprehensive ultrasonography exam is the low specificity in assessing calf veins, which could lead to an increase in false-positive results and the overdiagnosing of isolated calf DVT. In fact, registered vascular technologists in this study identified 19 of 61 patients (31%) with isolated calf DVT. The test is even less accurate when performed by less experienced personnel. The exam may also improve the cost-effectiveness of diagnosing DVT when used in conjunction with pretest clinical probability scores or D-dimer testing, though this remains to be validated in clinical trials.